An exerpt from a wonderful Homify write-up that we were featured in twice! The space in a kitchen always seems less, how much ever there may be. If the kitchen is small, there is generally not enough storage space, and even not enough work top space, and if the kitchen is large, it does not seem right to waste the center space, since all the work tops are on the sides. This is the reason that a kitchen island works perfectly well in both big and small kitchens. There are many benefits of having a kitchen island. If you are planning to get a kitchen island for your home, first thing is to think about the purpose that it will solve. It should either provide for more storage, or should hold one or both of the kitchen utility features, the sink and the stove, or it should serve as the dining table. Once your purpose is established, designing a kitchen island becomes much more efficient. There is no dearth of ideas when it comes to kitchen island design. You can let your imagination run wild and create something completely unique and beautiful for your home, right for good use in your own kitchen. There is no hard and fast rule to the design ideas when you are planning to install an island in your kitchen. 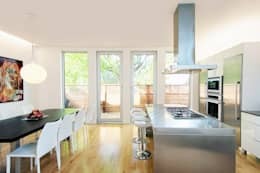 It could be like a multilevel counter with high stools, or a central cooking station with pots and pans hanging over the island from a rod, or it could be just the right place to hold the sink on one side and food preparation space in the other. But keep in mind that is very important to know the actual space you have in your kitchen so you create an island with the right measurements. Talk with a kitchen planner or an interior designer could help greatly! The good thing about adding seating in the kitchen is that creates a much more friendly enviroment for guests. And the seating will also add functionality to the kitchen without any doubt! Evenmore, the kitchen island with seating is a fantastic idea if you are looking to create a more relaxing area where to have a meal in daily basis. The island in this picture serves the purpose of food preparation as well as offers seating space. A kitchen island can be made to contain both the essential working units, i.e. the cooking unit, the preparation unit and also be use as a storage. Consider use the island for storage if you don´t have enough cabinetry. Storage space is a priority in the kitchen, specially in the small ones, as we need to keep pans, pots, food containers, etc, organized. This way you will have free space for food preparation and cooking. This picture is a perfect example of a kitchen island with a dedicate space for cooking. Having the stovetop located in the island help to spread the workflow in the kitchen. This is very convenient if there are more than two persons cooking at the same time. But, be careful because installation can be tricky. Therefore, is very important you ckeck with a professional topics like ventilation for example. If you have a small kitchen, you can still plan to have a central island to take advantage of the extra working space and some extra storage space under that. The island for a small kitchen will be smaller than usual and you will need to ensure leaving around 42-48 inches of space between the walls of the island and the side counter to allow easy movement around the kitchen. There are two types of kitchen island possibilities: permanent kitchen islands and moving or floating kitchen islands. The advantage of a floating kitchen island is of course the chic look that it gives to the kitchen. It also gives the option of removing the island altogether when you need a uniform space. A floating island shall naturally be used for food preps, and dining and not for washing since that would mean having some connections down under too. Hope you liked these kitchen island designs. Here are a few more fantastic ideas for kitchen islands. What kind of an island do you think will suit your kitchen?